On Daniel Tucker’s thirteenth birthday, a hawk flies over his family’s farm. Does the hawk announce a visitor, or warn of imminent danger? Daniel’s mother and sister listen for the hawk’s message, but something urgent stirs inside Daniel. He struggles to find his own path between the heritage of his Pequot mother and the customs of his English father. Meanwhile, a new family has moved into the crumbling cabin next door. Hiram Coombs can’t believe his parents have returned to Vermont now that the Revolutionary War is over. Don’t they remember the terror of the raid, when Indians and Redcoats burned the family’s old farm and kidnapped Hiram’s uncle? When Hiram encounters Daniel at the trout stream that separates the two farms, he sees only a “dirty Injun,” while Daniel says Hiram is “buffle-brained.” Within a few days, the arrival of two more unexpected visitors heightens the tensions between the boys and threatens to rekindle the smoldering embers of the war. Many years ago, my great-uncle Carleton Griswold Ketchum sent me an article titled “Randolph’s Indian Princess.” The article told a fascinating story about a Pequot Indian midwife named Margery Daigo and her husband, Joseph Griswold, who settled in Randolph, Vermont before the Revolutionary War. They met when Joseph had an accident and nearly drowned in the Connecticut River. Margery and her father, who were both healers, rescued Joseph and nursed him to health. The young couple married and moved to Vermont where Joseph farmed and Margery became the only healer for miles around. Griswold was a family name, and Margery came from the same town as my great-uncle’s grandfather, so he thought we might be related. “You should look into this,” my uncle said. “It would make a good story.” But the article was unsigned. Did it come from a book, or a magazine? I couldn’t tell. I even wondered if the whole thing was made up. I put the article into my “Idea File” where it sat for almost thirty years. I never forgot the story. I even tried to write a novel using a few elements of the original article, but I didn’t have enough background information. Then, I moved to Massachusetts soon after the U.S. government finally gave the Pequot Indians official tribal recognition. The Pequots regained control of their land and started a successful casino. They used some of the profits to build a beautiful museum. It tracks Pequot history from before the time of contact with Europeans up to the present. The museum also boasts a wonderful research library. I visited the museum many times and received invaluable help from the staff and from their informative displays. I watched a Pequot craftsman build a canoe, as Daniel decides to do at the end of the novel, listened to a lecture about the importance of hawks and other raptors to their spiritual beliefs, and attended their annual powwaw that celebrates the corn harvest. A museum employee (who, like Daniel, is also part native, part Anglo) read the novel for accuracy and told me it was the first book she had ever read that accurately portrayed someone of mixed heritage. While I was researching the novel, the Internet exploded—and with a few clicks of my mouse, I was able to track down Vermont historians who helped me collect more information about my ancestors. After nearly thirty years, I was ready to write my family’s story. FAQ: Were these people really your ancestors? Yes! As I began my research, I got in touch with the Randolph Vermont Historical Society and received a letter from its director, Miriam (Mim) Herwig. She wrote that she had many materials related to the Griswold family—and that she was the historian who had written the original article about Margery. My husband and I visited the Herwigs right away. They lived on a ridge overlooking the river valley, in a brick house built by one of Margery’s nephews. The Herwigs had many documents waiting for us. When I unrolled my family tree, we matched it with Mim’s information, and discovered that Margery and Joseph Griswold were my great-great-great-great-great grandparents. 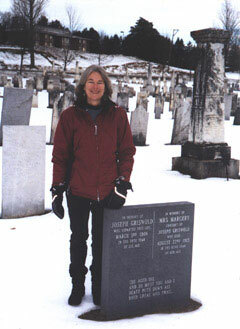 Mim’s husband, Wes, took us across the road to the town cemetery, where Margery and Joseph Griswold were buried side by side. We could barely read the faint inscriptions, carved into the slate headstones long ago, yet I felt an immediate connection to my ancestors, whose legacy had lasted into the 21st century. FAQ: Why does your author photo show you standing in a cemetery? I’m standing next to my ancestors’ graves. After I visited the Herwigs to do my research, a stranger called me on the phone and said, “Hello, cousin!” He told me that Margery and Joseph were his ancestors, too. He had always wanted to repair their gravestones. Would we like to help? We knew that terrible things had happened, in the past, to people who moved the stones covering Margery’s father’s grave, so we were nervous about disturbing Margery’s gravesite. Still, the stones were crumbling. We decided to use the original stones as a base for a new headstone. That way, we could keep the old stones in the same location. A local stonemason promised to carve the same inscriptions on the new monument. When Jim and the stonemason began to dig a trench for the new marker, they discovered that someone had made a similar repair years earlier. Two faded headstones, even older than the ones we planned to replace, lay hidden underground. The two men carefully set the second set of stones on the originals, and anchored the new headstone on top. A few months later, my husband and I visited the restored graves and burned Indian sweetgrass at the site, to honor the ancestors and their legacy. FAQ: So—what is true in this story, and what is invented? Although I changed names and invented places and incidents, I incorporated many of the facts about the Griswold family into my novel. Whenever I write historical fiction, I try to make sure that the details I include are as accurate as possible. I do extensive research into the past to find out about period clothing, food, language, work and tools. I want to know how people built their homes, how they traveled, what games they played. I even research the weather. Reading old diaries and letters, I discovered that a freak early snowstorm fell on Vermont in October of 1780, and I incorporated that storm into the story. I include real historical events that would have had an impact on my characters, such as the so-called “Indian Raid” that changed Hiram’s life, or the fact that Vermont was still an Independent Republic when the American Revolution ended. As they read, I hope readers feel that they have stepped out of a time machine into another world, where people dress and speak differently than we do, where their manner of travel, work, and play might seem strange. Yet, in spite of the years that separate us, perhaps readers will realize that people in the past had feelings, fears, ambitions, and dreams that remind us of ourselves. 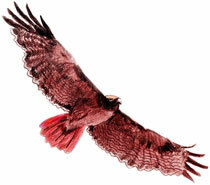 FAQ: Why is the hawk so important to your story? In this novel, Daniel’s grandfather is a powwaw, or medicine man. Pequot people believed that powwaws held great spiritual power, or mundtu. They also believed that powwaws acted as messengers between the spiritual and physical worlds, and that they could assume the form of birds, snakes, or other animals. While I was writing the novel, I saw an unusual number of hawks, including goshawks and sharp-shinned hawks. But red-tail hawks appeared most often. They flew over our pasture in Vermont. They swooped over my car when I was driving in city traffic. They soared above the trails where my husband and I take our favorite walks. I started to wonder if they were trying to send me a message. One day, while I was walking beside the Charles River, I saw a red-tail hawk and immediately had the idea for a poem called “Messenger.” I ran to my car, pulled out my notebook, and wrote the poem that opens the novel. I was grateful to that hawk for her inspiration. If you have read my quartet of young adult novels, you might realize that the fictional town of Griswold, Vermont (the setting for Where the Great Hawk Flies) is the same town where my modern characters—Alex and Rita, Todd and Molly—lived more than 200 years later. Can you find any landmarks that are the same?